Ardipithecus is a genus of an extinct hominine that lived during the Late Miocene and Early Pliocene epochs in the Afar Depression, Ethiopia. Originally described as one of the earliest ancestors of humans after they diverged from the chimpanzees, the relation of this genus to human ancestors and whether it is a hominin is now a matter of debate. Two fossil species are described in the literature: A. ramidus, which lived about 4.4 million years ago during the early Pliocene, and A. kadabba, dated to approximately 5.6 million years ago. Behavioral analysis showed that Ardipithecus could be very similar to chimpanzees, indicating that the early human ancestors were very chimpanzee-like in behavior. Australopithecus ( OS-trə-lo-PITH-i-kəs; from Latin australis, meaning 'southern', and Greek πίθηκος , meaning 'ape', informal australopithecine or australopith is a 'genus' of hominins. From paleontological and archaeological evidence, the genus Australopithecus apparently evolved in eastern Africa around 4 million years ago before spreading throughout the continent and eventually becoming extinct two million years ago. Australopithecus is not literally extinct as the Kenyanthropus, Paranthropus and Homo genera probably emerged as sister of a late Australopithecus species such as A. Africanus and/or A. Sediba. During that time, a number of australopithecine species emerged, including Australopithecus afarensis, A. africanus, A. anamensis, A. bahrelghazali, A. deyiremeda, A. garhi, and A. sediba. Sahelanthropus tchadensis is an extinct species of the Hominini and is probably the ancestor to Orrorin that is dated to about 7 million years ago, during the Miocene epoch, possibly very close to the time of the chimpanzee–human divergence. Few specimens other than the partial skull, nicknamed Toumaï, are known. 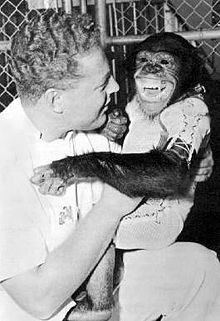 The family Hominidae (hominids), the great apes, includes three extant species of orangutans and their subspecies, two extant species of gorillas and their subspecies, two extant species of chimpanzees and their subspecies, and one extant species of humans in a single extant subspecies. Australopithecines are generally Australopithecus, and it typically includes the earlier Ardipithecus. All these related species are now sometimes collectively classified as a subtribe of the Hominini tribe called Australopithecina. They are the extinct, close relatives of humans and, with the extant genus Homo, comprise the human clade. Members of the human clade, i.e. 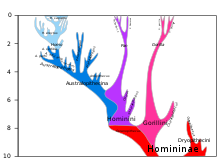 the Hominini after the split from the chimpanzees, are now called Hominina. The chimpanzee–human last common ancestor, or CHLCA, is the last common ancestor shared by the extant Homo (human) and Pan genera of Hominini. Due to complex hybrid speciation, it is not possible to give a precise estimate on the age of this ancestral population. While "original divergence" between populations may have occurred as early as 13 million years ago (Miocene), hybridization may have been ongoing until as recently as 4 million years ago (Pliocene). Graecopithecus freybergi is a hominin originally identified by a single mandible found in 1944. Since then, analysis of tooth specimens, dated to 7.2 million years ago, has led to suggestions that Graecopithecus may have been the oldest direct ancestor of humans excluding the chimpanzee lineage, or alternatively the last common ancestor of both humans and chimpanzees. The creature was nicknamed ‘El Graeco' by scientists. The evolutionary history of the primates can be traced back 65 million years. One of the oldest known primate-like mammal species, the Plesiadapis, came from North America; another, Archicebus, came from China. Other similar basal primates were widespread in Eurasia and Africa during the tropical conditions of the Paleocene and Eocene. Purgatorius is the genus of the four extinct species believed to be the earliest example of a primate or a proto-primate, a primatomorph precursor to the Plesiadapiformes, dating to as old as 66 million years ago.